Currently there is a petition to ban third generation oral contraceptives containing gestodene and desogesterel because they are associated with a 1.7 to 3 fold increased risk of venous thromboembolism (VTE). There are many formulations of birth control pills. These different formulations exist to minimize side effects and maximize noncontraceptive benefits. The noncontraceptive benefits include improvement in metrorrhagia, dysmenorrhea, premenstrual syndrome and acne as well as possible prevention of ovarian and endometrial cancer. Third generation pills have been shown to resolve or to reduce acne and hirsutism. They are suitable for use in patients with diabetes or lipid disorders because they have minimal impact on blood glucose levels and the lipid profile. They also are less often associated with breakthrough bleeding. Breakthrough bleeding is one of the major reasons oral contraceptive use is discontinued. It is certainly true that these pills are not suitable for use in all women. It is also true that certain women will be able to take these pills without complication while receiving significant noncontraceptive benefit. That statement is true of all birth control pills not just 3rd generation pills. The risk of VTE associated with pregnancy alone is far greater than the risk associated with 3rd generation pill use. Pregnancy confers a 5 fold or greater increase in risk of VTE. Therefore the contraceptive benefit outweighs the risk of use. Rather than depriving women of the significant benefits of 3rd generation pills, it is more reasonable to use these pills in appropriately selected patients and to counsel those patients about the risks as well as the benefits. Editor's Note: ClotCare received the following email from Jodi Wagner, RPh in which she expresses concerns regarding some of the statistics presented in this posting. We have attempted to allow the experts to present all sides of this issue, as it is clearly controversial. Thus, we have provided Ms. Wagner's comments below in an attempt to add to the discussion on this issue. 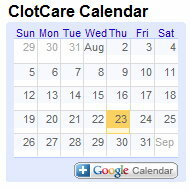 As always, you are welcome to send questions or comments to Marie Walker at webmaster@clotcare.com. I read Lisa Moore, MD's opposition to a petition to ban third generation oral contraceptives. She states "Currently there is a petition to ban third generation oral contraceptives containing gestodene and desogesterel because they are associated with a 1.7 to 3 fold increased risk of venous thromboembolism (VTE)." Later in the article she states "The risk of VTE associated with pregnancy alone is far greater than the risk associated with 3rd generation pill use. Pregnancy confers a 5 fold or greater increase in risk of VTE. Therefore the contraceptive benefit outweighs the risk of use." However, I think the statistic of 1.7 to 3 fold increase of VTE of those on 3rd generation is compared to women on second generation oral contraceptives. Here is an excerpt from the Public Citizen petition "But three independent studies published in December 1995 all concluded third generation oral contraceptives had about twice the risk of venous thrombosis when compared to second generation oral contraceptives.,, Numerous similar studies have found generally the same increased risk with the most common estimate of this risk being 1.5 to 2.4 -fold higher compared to second generation oral contraceptives.,,,,,,,,,, The difference in venous thrombosis risk between second and third generation OCs is even higher among women who use oral contraceptives for the first time." (Note: References are cited and linked to at http://www.clotcare.com/clotcare/oralcontraceptivebloodclots.aspx). If the comparison were to women not on an oral contraceptives the number would be much higher. The Public Citizen petition mentions a case control study comparing pill-users to non pill-users. "The increased risk of death from a pulmonary embolus for women who took levonorgestrel OCs was 5.1 to 1(compared to non pill-users), but the risk of death from a pulmonary embolus for women who took desogestrel or gestodene containing OC's was 14.9 to 1. Our calculation for the risk of fatal pulmonary embolism comparing 3rd generation OC users with 2nd generation OC users is 2.1 (95% CI 0.45-10.15)." I think Dr. Moore's statistic that 3rd generation OCs are associated with a 1.7 to 3 fold risk of VTE should be clarified. From looking at other sources, it seems like the 1.7 to 3 fold risk is when compared to users of 2nd generation OCs, not non-pill users and therefore can't be compared with her stated 5 fold increase of VTE in prenancy. Additionally OCs are not the only way to prevent pregnancy, some methods do not increase the risk of VTE at all. The following definitions are from http://www.dictionary.com.